Officer Margul & MeikyIt was a fun filled time as University City Police Officer Shaun Margul and his K-9 partner Meiky stopped by for a visit with the Super Stars. 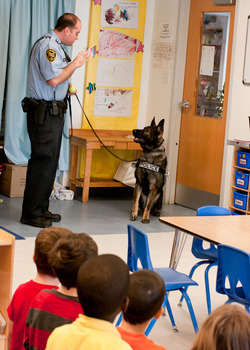 With a good overview about police dogs from Officer Margual and lots of interesting questions from the children the class learned a lot about the role of dogs in the police force. Although Meiky was working and unable to be touched, the children were very attentive to everything he did while in the classroom. View all the photos in the Police Dog Meiky Gallery.